Unless you are living under a rock in the PNW, then you've seen these everywhere. They seem to adorn the roof of everything from classic overland rigs to yo mama's mini cooper. So, what's the deal? They’re super roomy - our Cascadia Vehicle Tents Mt. Rainer Stargazer tents can sleep 2-4 people depending on cozy you wanna get. Your tent is on your vehicle which means you don’t have to find the “perfect spot”, just find a somewhat level spot to park your rig and voila! You’re home! Plus the higher vantage point can provide some great views, and keep critters (like snakes, raccoons, and bears - oh my!) away from you at night. 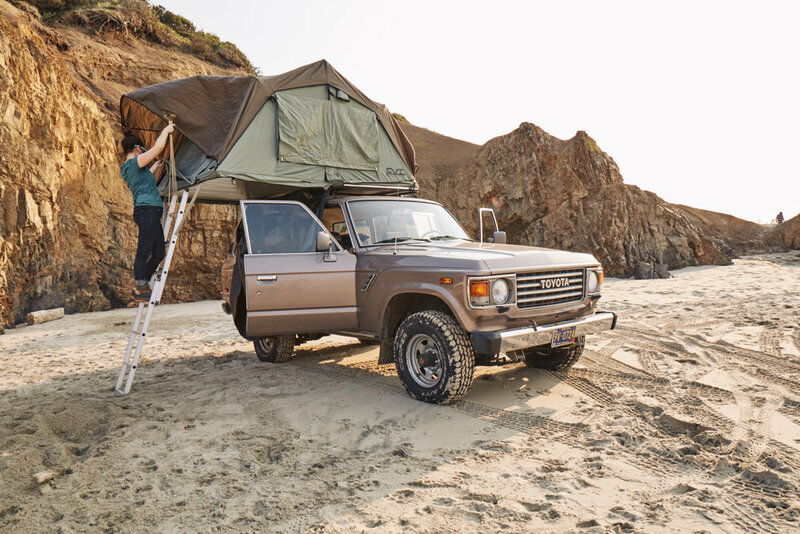 Because they aren't designed to be easily carried on your back, rooftop tents are constructed of heavy duty materials that withstand inclement weather better and have nice additional features like window awnings and skylights! Cascadia Vehicle Tents Mt. 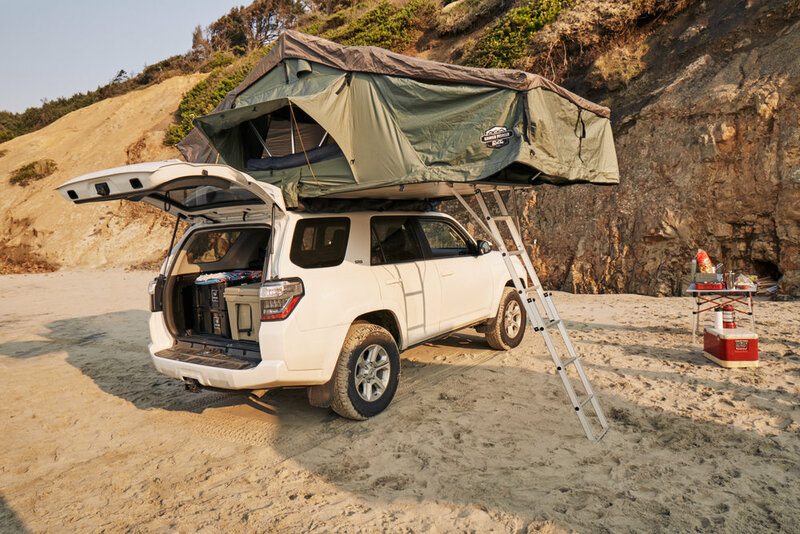 Rainer Stargazer Rooftop tent x Wonderland Expeditions Toyota 4Runner - a match made for backcountry fun. 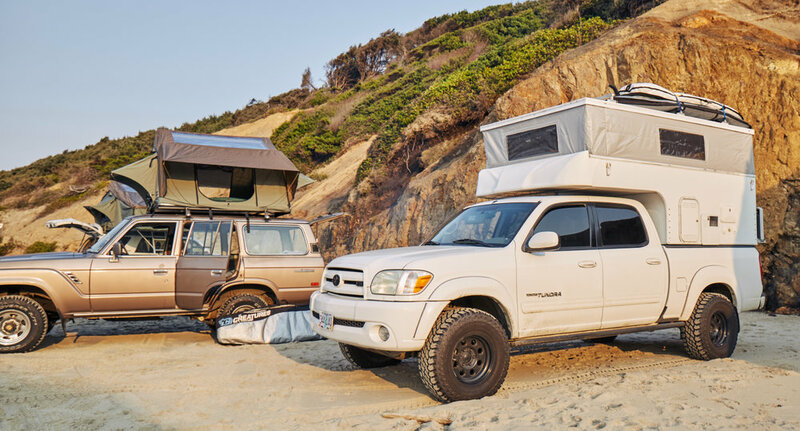 When paired with a capable 4x4 vehicle, like the 5th Gen Toyota 4runner - you've got a turn-key overland rig that is ready to take you to places most campervans can only dream about. And for those who need the practicality of a SUV for their everyday lives, but still want a rig to easily load up get lost with on the weekends, the rooftop tent is a great compromise for getting out there with minimal effort and livin' a bit more comfortably than those dirtbag days in the bed of truck or on the ground. 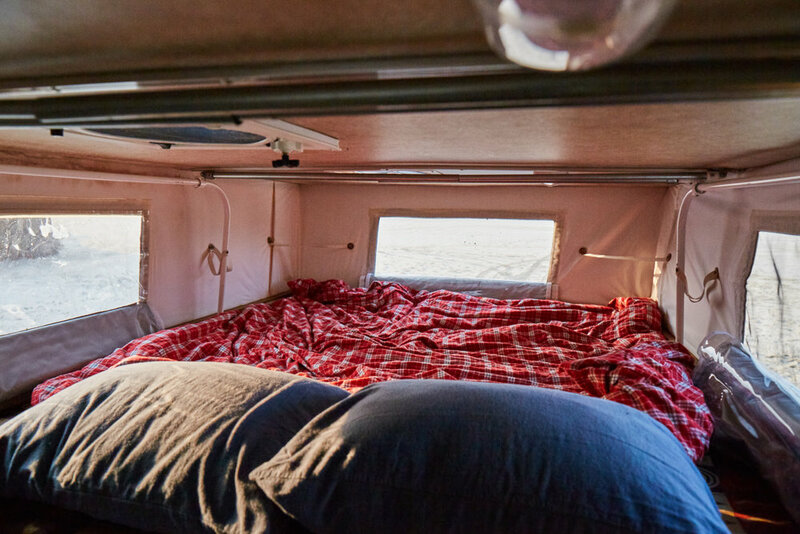 A pop-up camper is a camper that slides into the back of a standard pickup truck, and when you’re ready to put your feet up for the day, you “pop up” the roof by pushing it up from the inside creating a surprisingly large hangout with room to stand. 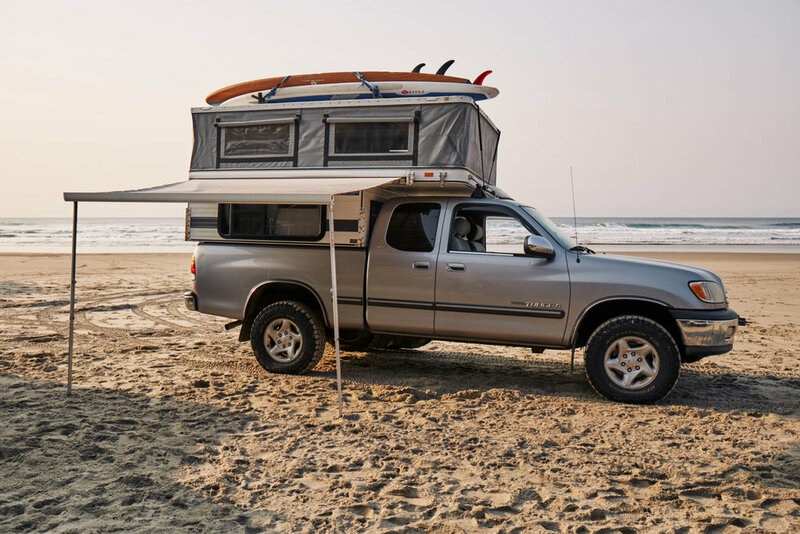 This sleek design means that when you’re driving, you’re hardly bigger than a standard size truck, but when it’s time to camp, you’ve got plenty of room to cook, sleep, and hang out. Yeah that's right, they've got a heater, stove, sink, refrigerator, table, LED lighting and a queen sized mattress - pretty much a NYC apartment in the back of your truck that you can take to some of the most remote and beautiful locations on earth. "That's getting soft" you say... I dare you to try it. These campers, outfitted like our Four Wheel Camper Eagle and setup on a capable platforms like the underrated 4x4 Toyota Tundra, will take you far further than you thought you could go with this much comfort and allow you to camp out for extended periods of time in locales or weather that would be downright unpleasant or unaccessible with most other rigs. If it’s raining sideways, hop in the back of the truck and play some cards until it passes. In between overlanding and adventuring, you’ll stay safe and warm in these durable, cozy campers. The added benefit of these adventure-ready truck campers is that they are highly capable overlanding vehicles. Unlike many of the campervan rentals out there, our rigs have 4x4 drivetrains, high ground clearance, off road tires, and (psst!) we actually let you take them off the highway. Plus they have plenty of old school style (check out Elsie, our FJ60 to see what I mean)! 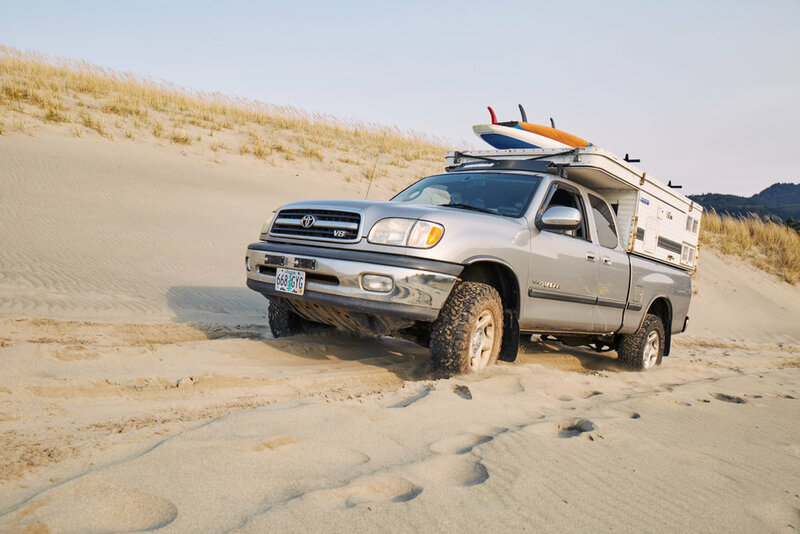 So if you’ve noticed an explosion of these overland rigs in the PNW, now you know why... Reserve yours today and experience what overlanding is all about.